The game is much more interesting if the doll many outfits. The clothing should be varied. One of the ways of its manufacture — tie openwork dress crochet, the more so now that you can even use small remnants of yarn. Select the right yarn for crochet dress crochet. For this purpose, suitable thin remnants of thread. It can be cotton yarn, for example, iris or blended, for example, "Olga". Only need about 50 grams, use leftover yarn of contrasting colors, so outfit for the doll will look brighter. This calculation is proposed for crochet dresses on the doll size is about 35-40 cm, if you need to knit a dress for toy another value, then increase or decrease the number of loops, respectively. Yarn base shade dial a chain of air loops 49 of the bottom 48 of the loop — based and 1 air loop for lifting. In the second row provarite the first column without nakida in the air the third loop from the hook, then tie a single column without nakida in each loop the base to the end. Then divide the work into 3 parts: the first 12 columns to the right side of the back, the second 24 columns for the front and 12 columns to the left of the back. 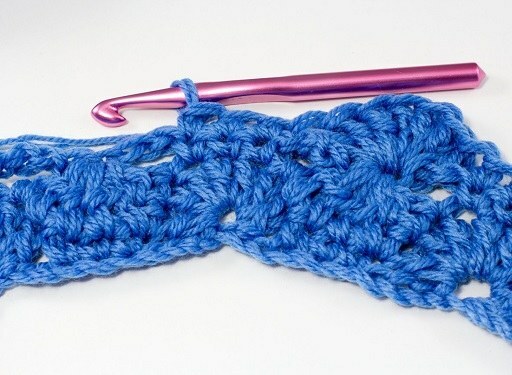 Next knit each part separately. To the front of the dress provarite on average 24 loops of columns without nakida number to the eighth inclusive. In the ninth, divide the work into 3 parts: 6 columns to the right shoulder, 12 for the mouth and 6 for the left shoulder. First provarite right 5 rows on the first six columns loops part of the manhole, close the and knit 5 rows of columns without nakida loop for the left shoulder. Thread attach and remove. Next, proceed to knitting the right side of the back. Provarite columns without nakida without of increases obivok and before the eighth row, inclusive. Next, divide the painting in half. Provarite 5 rows of columns for processing the shoulder line. Next 6 stitches (for the neck) close. Tear off the thread. The left part of the dress is knit symmetrically right. In the middle of the back of the bodice, attach a new thread from the skein of a contrasting color and knit openwork pattern of 13 rows. In the first provarite loop all columns without nakida. Then make arches out of six loops, promazyvaya them into every fourth loop of the previous row. In the next row, knit for 9 polytypical through one arch. Then again tie the arch of air loops. Continue alternating rows until the end of the crochet skirt. The last row tie "crayfish" step by step " thread, which was knitting the bodice. Stitch the shoulder seams. The neckline and armholes, tie contrasting thread color lobster step". Along the slit at the back dial on both sides the details of the loops and tie straps also lobster step". Attach the thread at the top of the clasp and dial a chain of 15-20 loops. At the end of the thread attach and remove. A similar drawstring tie on the other side of the back. To decorate the dress, tie crochet some flowers, sew them at the waist. Midway adorn with beads.